Your makeup brushes are disgusting. My makeup brushes are disgusting. We're all gross, guys. Every time you use a brush to apply makeup to your beautiful mug and make your face look like a million bucks, you're also distributing a million little bugs and bacteria onto your brushes, and then you just put them down and use them the next time you apply your makeup. I mean, by you I mean all of us. We all do this. I spot clean my brushes with a brush cleaning spray and a paper towel in between uses - especially eye makeup brushes, nothing worse than going to put on one color and ending up with the last color you used on your lids instead - but brushes need a deep clean regularly if you want to avoid a real nasty bacteria-fest. I was trolling the aisles of Marshall's a few months ago looking for my favorite, elusive face scrub when I spotted a silicone makeup brush cleaning mat on the clearance rack. I could assess its quality (perfectly fine) and it was just $5, which is what we should all pay for what are essentially potholders with suction cups on them. 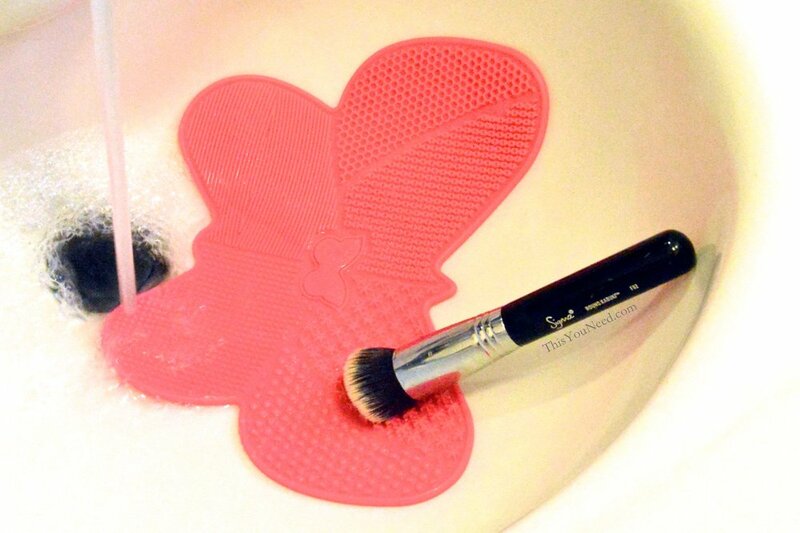 I brought my (butterfly shaped) brush cleaning mat home and took it for a spin. Honestly, for how completely these gizmos change the brush cleaning game, I wouldn't blame you for dropping $25 on one. I much prefer the mat version to a glove. You can put some soap on one section and have that be your lather zone, have another area be under the faucet for rinsing, and use a separate area for really scrubbin' those bristles. You can clean all your brushes one handed and in half - no, a third of the time it would take to clean them by hand. Plus, at least for me, my hands would alway get so cold from the water and my joints would ache afterward, so not having to get my hands wet is a huge plus. Here are a few silicone brush cleaning mat options, but don't count out the ol' Marshall's clearance rack!